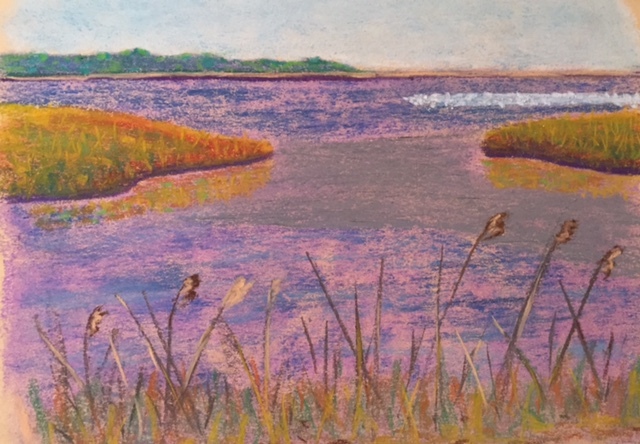 Last week, I had the wonderful opportunity to paint ‘en plein air’ at Bombay Hook National Wildlife Refuge with the Plein Air Painters of the Mid Atlantic (PAPMA). Although a tad chilly, it was a mostly sunny day and not too breezy. Great weather for October! I love ‘the Hook’ in the post-summer season. Most of the annoying insects are gone, and November is one of the peak months for migratory birds. A huge win, win for painting outside for several hours in a sitting! Since I am new to plein air this year, I wanted to choose a medium that was easy to transport, work with, and set up/break down in the advent of a sudden weather change. I chose soft pastels. Also, I like how pastels feel in my hand as I work with them on the paper. For this piece, I used Canson’s Mi-Teintes paper in a soft yellow, and used the smoother side. I painted with a combination of Prismacolor’s Nupastels and Loew Cornell soft pastels. My fixative is Krylon’s Workable Fixatif. I used lavender as my base layer, and worked it in with my fingers. Then, I chose a medium value to lay in the basic shapes of the different elements in the painting, and sprayed my first layer of fixative. Starting with the sky, I painted from background to foreground, top to bottom, with the exception of the snow geese and the individual reeds. I then sprayed my second layer of fixative, and let dry. I added the individual blades of grass on the large marsh clumps and the final touches on the reflections in the midground. Then, I added the phragmites in the foreground. Finally, the snow geese were the last to be added, and the painting was finished. Woot! I really enjoyed working on this piece, and was relaxed during the entire process. I am mostly satisfied with the way all of the individual elements turned out, and am happy with my composition. I had a great day plein air painting with PAPMA at Bombay Hook, and am looking forward to my next excursion!